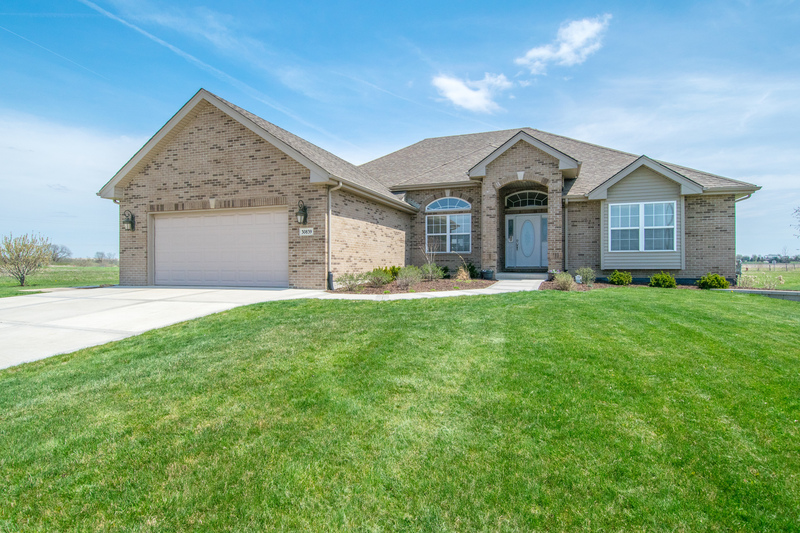 4 bedroom ranch with an open floor plan and vaulted ceilings in exclusive Water&apos;s Edge subdivision! Quiet street, friendly neighborhood, and an exceptionally private lot. Sunlight flows through the large eat-in kitchen equipped with an island, granite counter tops, and stainless steel appliances which are staying. Beautiful hardwood floors in foyer, living room, kitchen, dining room, and hallway! The vaulted ceilings continue in the spacious master bedroom that features a large walk-in closet. The custom master bath has double sinks, a private soaking tub, as well as a separate shower! 3 full baths, finished basement, solid 6-panel wood doors throughout the home, and main floor laundry with newer vinyl plank flooring. Outside, the concrete driveway and custom stamped concrete back patio were finished less than 2 years ago, and the professionally landscaped yard with unilock accent wall was installed less than 1 ago. Minutes from I-55! Nothing to do but grab the keys and move in!